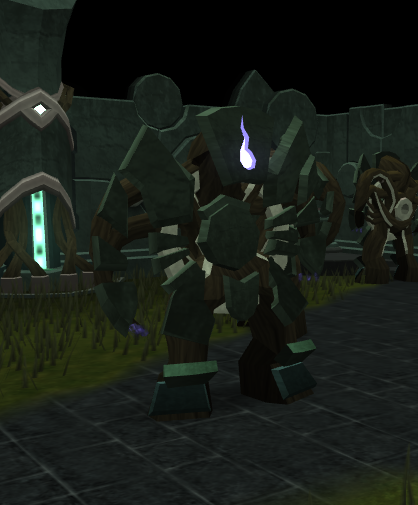 Cres's Automatons are robotic slayer monsters accessable after full completion of The World Wakes. 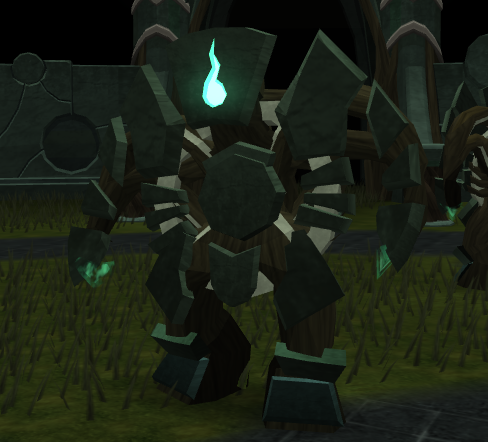 Requiring level 67 Slayer to kill, these creatures are known for dropping the tier 85 tank gloves in all 3 combat styles - Pneumatic, Tracking and Static, for Melee, Ranged and Magic respectively. 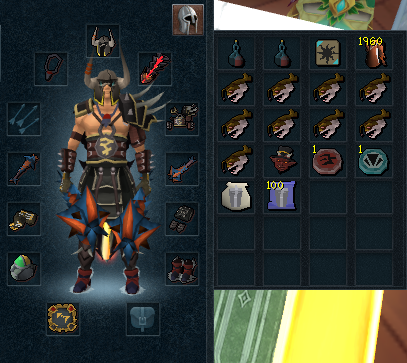 They can also be assigned as a slayer assignment to those with the requirements. 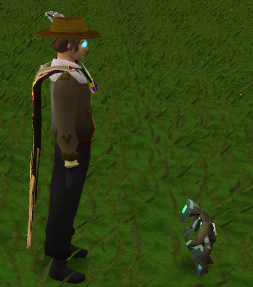 Alongside their glove drops, they drop various other stackable items, like herb seeds, Earth runes, noted Supercompost, ores, and magic logs, and also a very rare chance (roughly equal to a gloves drop) of dropping a Cresbot - a tiny Automaton that will follow you as a pet. 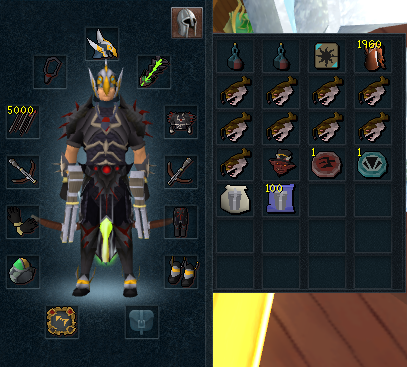 Automatons don't have the highest of defence, and thus your weapon selection can be more generous. 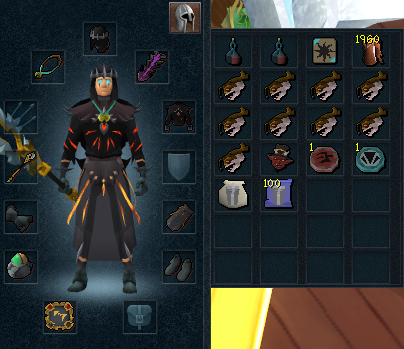 If your stats and equipment are higher than thus, such as if you have full Malevolent and a set of Drygores, or full Virtus and a Noxious Staff, there is nothing preventing you from using them. They will speed your kills up and are recommended if you have them. Also, level 95 Prayer (and completion of The Temple at Senntisten) for Turmoil / Anguish / Torment and Soul Split are very helpful prayers to use to keep you speed up your kills and keep your health up. 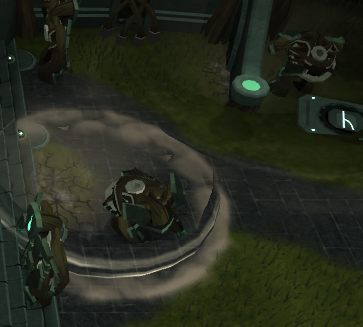 The best method to get to Automatons is to teleport using the Sixth-age circuit and then ask the Guthixian high druid to teleport you. The Automaton Tracer, weak to crush attacks. If you wish to melee the Automatons, your basic ability rotation will depend on your weapon/s - if you have 2h or Dual Wield. Universal abilities include Slice, Sever, Dismember, Punish, and Backhand / Kick. Dual Wield abilities include Decimate and Havoc, and 2h ones are Cleave and Smash. However, your thresholds will do the majority of the damage. Use Assault whenever it is off cool-down, and also use Slaughter and take one step forward to inflict an incredible bleed. If Dual Wielding, Destroy is another very powerful ability, and for 2h users you may also use Hurricane and Quake. However when Meleeing BE VERY CAREFUL OF THE AUTOMATON'S SPECIAL - Automatons have a special attack in which they will slam the ground with their hands repetitively, which will release shockwaves along the ground hitting into the high thousands at a rapid pace. 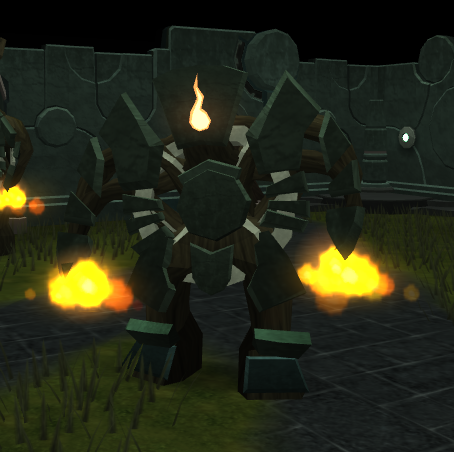 Two Automatons using their special attack. This can be avoided by stepping backwards - the escape ability is useful - but if you channel a combo ability such as Assault right as the Automaton begins it's special, you will have to break the ability and run to avoid being quickly killed. The Automaton Generator, weak to arrows. Your basic ability rotation should consist of the abilities (in order) Fragmentation Shot, Needle Strike / Dazing Shot, Piercing Shot, and Snipe. Be careful using Ricochet, as having multiple Automatons on you at once could drain your health at an alarming rate. The vast majority of your damage lies within your threshold abilities. There are four you will be using mainly - Bombardment, Tight Bindings, Snap Shot, and Rapid Fire. If you have all four off of cooldown, use them in that order - that is the fastest method to launch all four of them in quick succession. Smoke Tendrils is not recommended as it will damage you significantly. However with Soul Split this should not be too much of a problem. You will be out of range of the special attack, so you need not worry about it unless you like ranging from point-blank range. The Automaton Guardian, weak to fire spells. Probably the easiest method to take down Automatons, due to the fact you can farcast and safespot the melee Automatons, magic is good for those first learning to kill them. Use Fire Wave or any Surge spell if you have them. Your basic abilities should rotate through Impact, Combust, Wrack, Sonic Wave / Concentrated Blast, and Dragon Breath. Be wary when using both the later ability and chain, as it is difficult to fend of multiple Automatons at once if you catch any more with the AoE of those abilities. Use the two thresholds Asphyxiate and Wild Magic when you are able, as these both do very high damage even for thresholds and are where most of your damage will be sourced from. The best place to safespot the Automatons is around the small blockings on the sides of the entrances to the unaccessible storage bays that were used during the quest. Alongside their glove drops, they drop various other stackable items, like herb seeds, Earth runes, noted Supercompost, ores, and magic logs, and also a very rare chance (roughly equal to a gloves drop) of dropping a Cresbot - a tiny Automaton that will follow you as a pet. Their XP is not the greatest of all monsters but it is still decent and they offer good Slayer XP when on task.